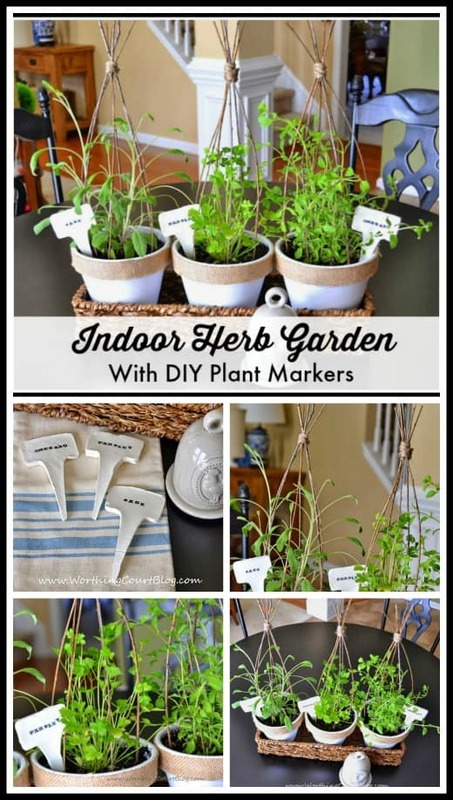 Have you ever put together an indoor herb garden? 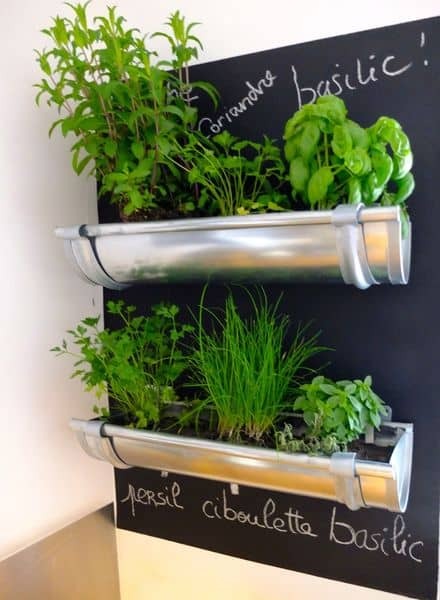 What could be more convenient than snipping herbs right in your very own kitchen?!? I made a mini version of one for the kitchen of our former home. I even made plant cages with weeping willow twigs and clay plant tag markers. It was so, so cute and I had lots of fun making the markers! Click HERE for all the details. The light in my former kitchen wasn’t bright enough to sustain the herbs, so they didn’t last very long. Boo. But, the breakfast area in the kitchen of our current home is filled with large windows that allow the morning sun to come pouring in, so I think I might try growing my own herbs once again. With that in mind, I’ve rounded up a few of my favorite diy indoor herb gardens. Old gutters attached to the wall would make great planters. Paint a patch of chalkboard to write the names of the herbs on. 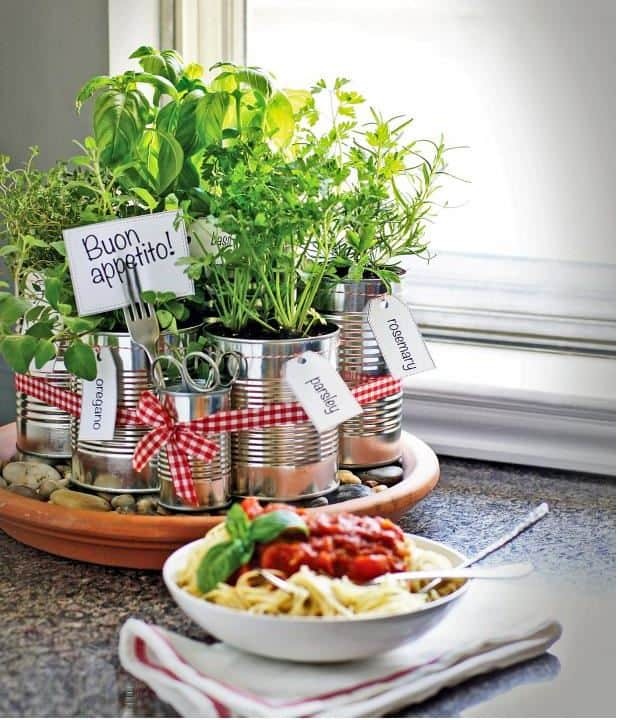 Make a countertop herb garden by planting herbs in recycled cans. Place them on a tray to make them easy to rotate to catch the sun. No floor or counter space? 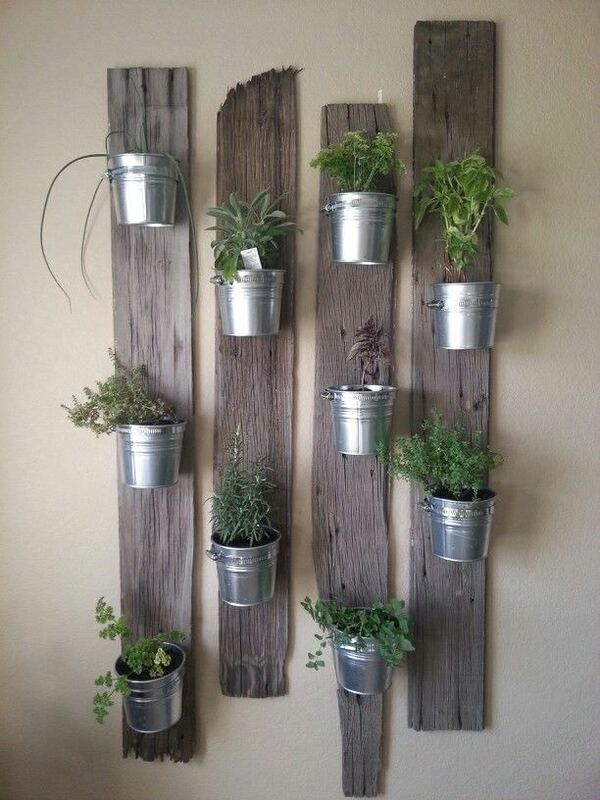 Plant herbs in small buckets attached to pieces of wood hung on the wall. Instant art too! 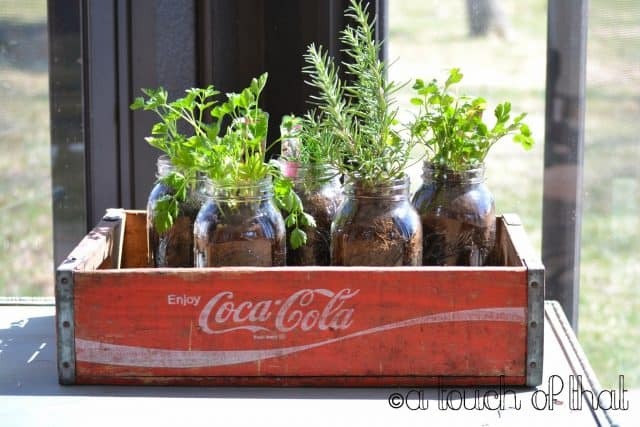 This is a really cute idea for those of us who like to repurpose vintage containers. 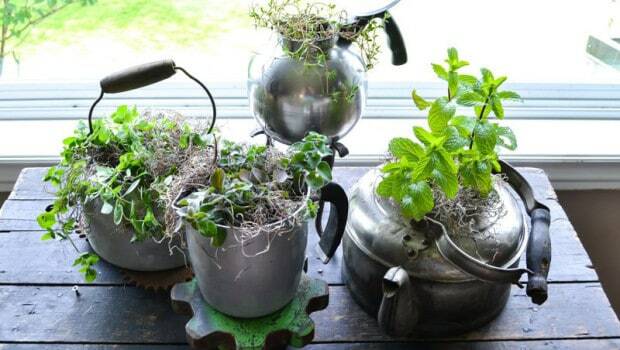 Plant your herbs in old pots and tea kettles. 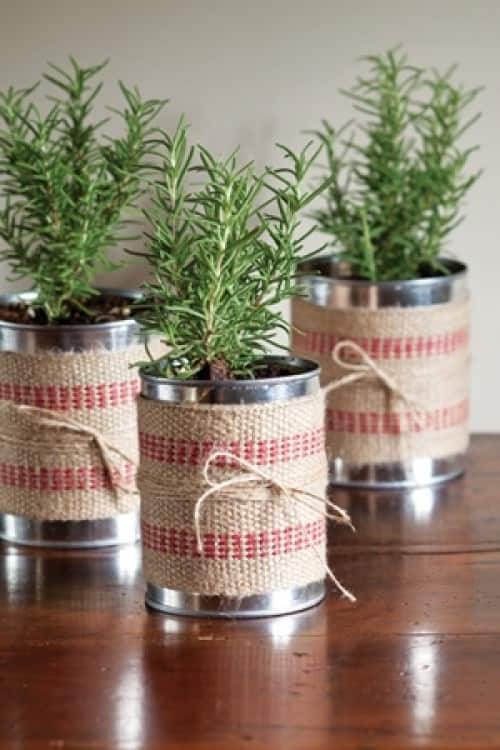 Another repurposing idea – plant herbs in cleaned tin cans wrapped with jute ribbon. Love the farmhouse look of this one! Let’s not forget about using good ole mason jars for a planter. 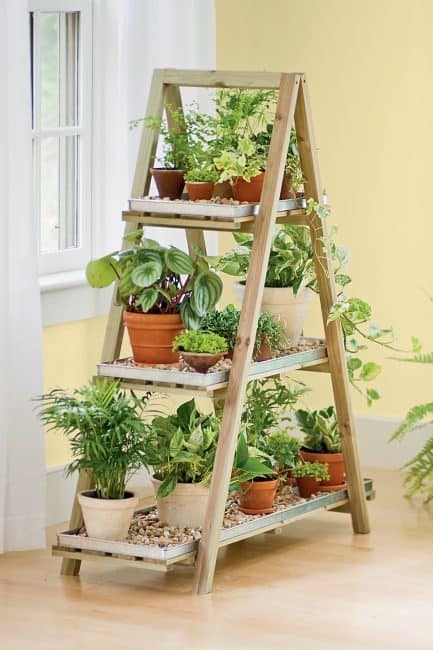 I have an old stepladder and I have floor space in front of window, so this idea might work well for me. Image found at Applied Health. Original image source unknown. 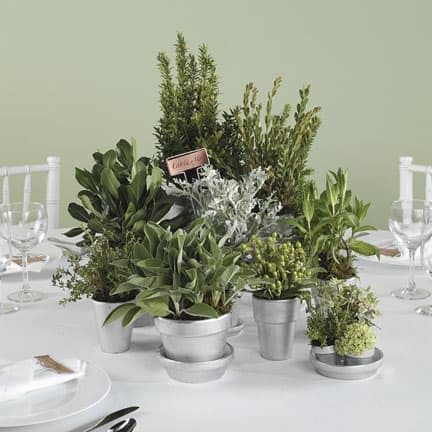 Kill two birds with one stone by grouping pots of herbs together for a table centerpiece. 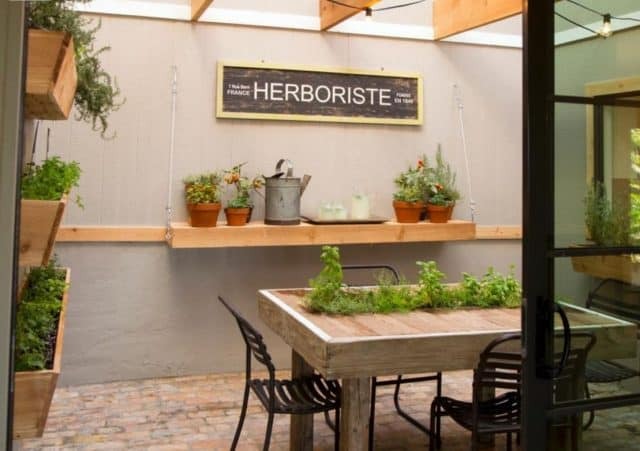 Of course, the ultimate is to have an entire room devoted to growing as many herbs as you could ever want! Of all the indoor herb gardens, your idea works best for me. My herb garden died while I was gone; but as uncreative as I am, I just stuck the ugly black planters the herbs came in from the store, plopped them in dipping dishes to prevent a mess, and called it good. You inspire me! 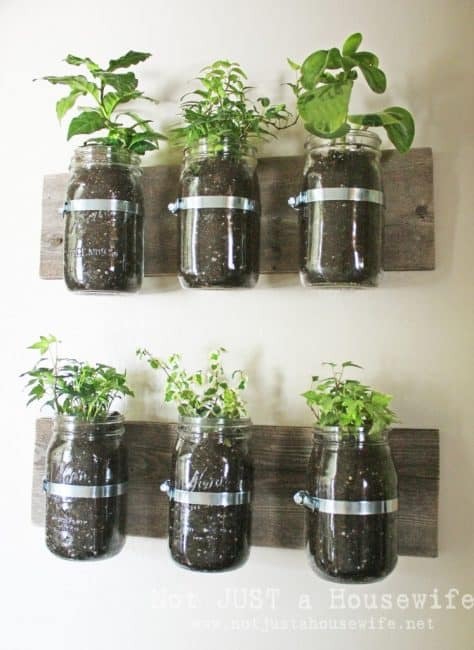 I pinned a mason jar herb garden the other day and wondered what Suzy would do to make it better. These are great ideas. Do you just keep pruning back to make sure they don’t get too big? Also, do you pick from the bottom or top?